Sudoku Rubik's Cube. Sudoku is a game that has generated much interest, who has not tried to make one. Now available in the Rubik's Cube. You have a new pastime, Sudoku Rubik's Cube for you to spend good and entertaining moments, such as when a nap if you're not too sleepy, or train, metro or bus. 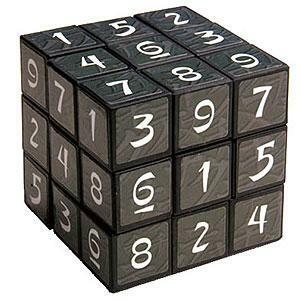 The operation is the same as sudoku, but you'll have to get all sides of the cube, ie, you have to make placing the numbers 1 to 9, so there is only one on each side.